Two games in, Team SoloMid looked poised to deftly sweep the number-two seed Cloud9 in the finals of the North American League Championship Series Spring Split. Cloud9 would not cede so easily, however, and rallied back to push it to a climactic game five, where a single clash would decide the champion of the split. Though TSM was dominant in the first two maps, game three was a turning point for Cloud9. Battling back with the help of rookie jungler Juan “Contractz” Garcia, a single teamfight swung game three in Cloud9's favor. Taking game four afterwards, a single match would determine the series outcome. Game five was a slugfest, with each team trading blow-for-blow. The gold and kill differential between the teams never widened too great, as each looked to eke out whatever advantage they could to win. At one point, in the span of half a minute, the teams took kills off each other in scattershot skirmishes across the map. At 38 minutes in, a clash in the top river gave Cloud9 the edge, as they took out most of Team SoloMid’s key players while keeping a solid amount of theirs alive. Turning that advantage into a baron kill, Cloud9 was poised to steal the series away in a reverse sweep—that is, until they got a little greedy with the buff. Team SoloMid turned the tables on Cloud9 and engaged on them at the best moment, wiping the few members left alive. As a full five, TSM stormed down the bottom lane and secured the win, becoming repeat winners in Vancouver finals and claiming the title of Spring Split champions. 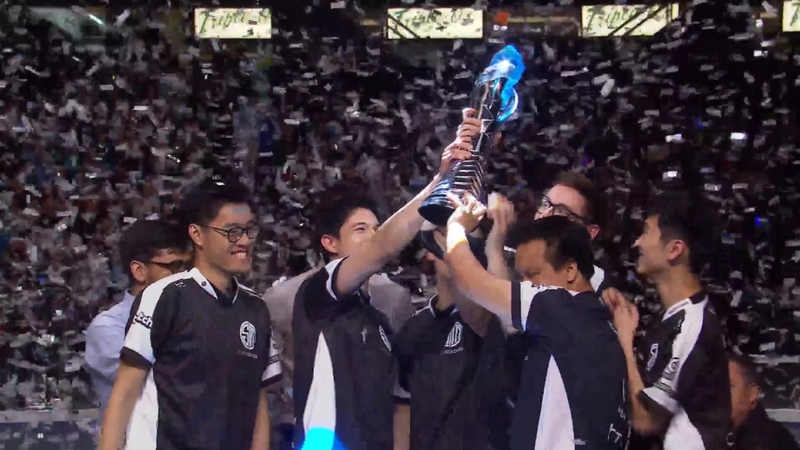 Though TSM reigns supreme, the teams will assemble again for the Summer Split later this year. In the meantime, the Mid-Season Invitational looms overhead, where SKT T1 awaits to crush all challengers. While the international stage is anyone’s game, Cloud9 and Team SoloMid demonstrated today that they’re both very talented teams, capable of putting on one hell of a final.